CBOE Total – since 9/27/95, with no data for 12/16/96, 6/11/98, 10/18/00 and 3/28/02. CBOE Index – since 10/17/03. CBOE Equity – since 10/17/03, with no data for 10/20/03. ISE Total – since 4/1/02, with no data for 7/5/02 and 11/28/03. ISE Equity – since 1/3/06. There are some inconsistencies in data across overlapping CBOE put-call ratio archives. We use the values in the most recent archives for each measure. ISE data derives from the ISE Sentiment Index, which is a call-put ratio. We transform this index into a put-call ratio comparable to the CBOE data. 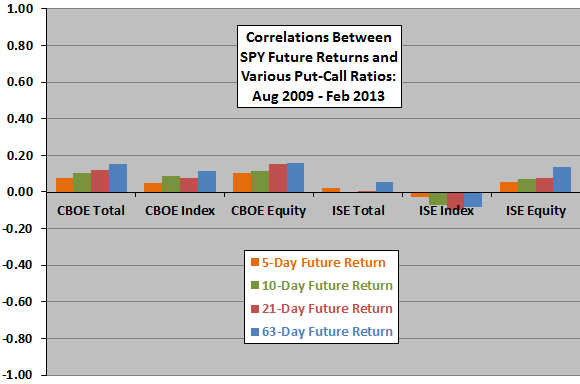 The following chart summarizes correlations between the alternative put-call ratios and future returns for SPY over intervals of 5, 10, 21 and 63 trading days using all available data. All correlations are very small, and some are opposite in sign from conventional wisdom (positive). The weakness and inconsistency of results undermine belief in a usefully predictive relationship. However, we look at recent subperiods in case older data is too thin for reliability. From the beginning of January 2006 (earliest availability of data for all six alternative put-call ratios) through the end of July 2009 (43 months). From the beginning of August 2009 through the middle of February 2013 (42.5 months). During the first subperiod, correlations are generally small and mixed in sign, generally not supportive of belief in the power of put-call ratios to predict stock market returns. 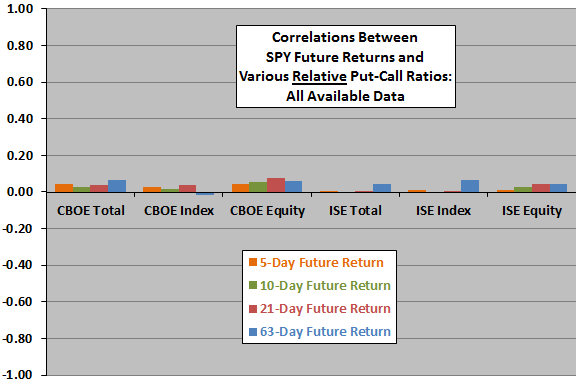 During the second subperiod, correlations for CBOE put-call ratios are all positive, while those for ISE ratios are mixed. Results mostly do not support belief in a reliable relationship. In case average put-call ratios are not stable over time, we consider ratios relative to their respective lagged 63-trading day (three-month) simple moving averages. 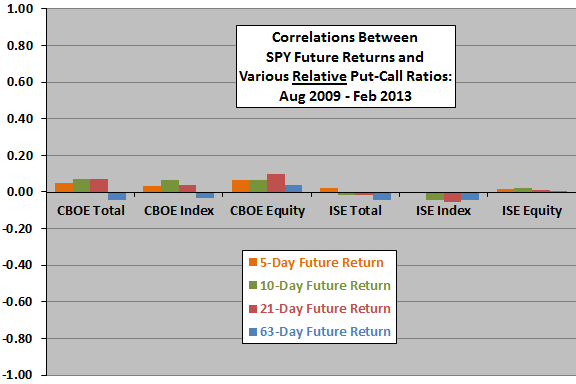 The next three charts summarize correlations between alternative relative put-call ratios and future returns for SPY over intervals of 5, 10, 21 and 63 trading days for all available data and for the two recent subperiods as above. While most of the correlations are positive, inconsistencies undermine belief in a reliable relationship between relative put-call-ratios and future stock market returns. Since the correlation between the CBOE Equity relative put-call ratio and 21-day stock market future return appears most consistent, we use a scatter plot to investigate this relationship in detail. Due to testing of many combinations, this selection introduces data snooping bias into results. 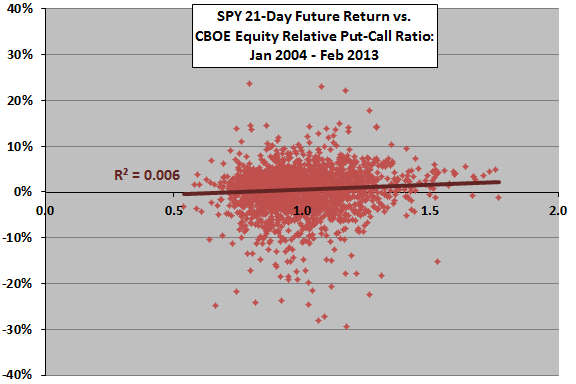 The next chart shows the daily relationship between the CBOE Equity relative put-call ratio and 21-day SPY future return since the beginning of 2004 (to allow calculation of the first relative ratio). The slope of the best-fit line is positive, with R-squared statistic 0.006 (variation in the relative put-call ratio explains less than 1% of the variation in next-month stock market return). 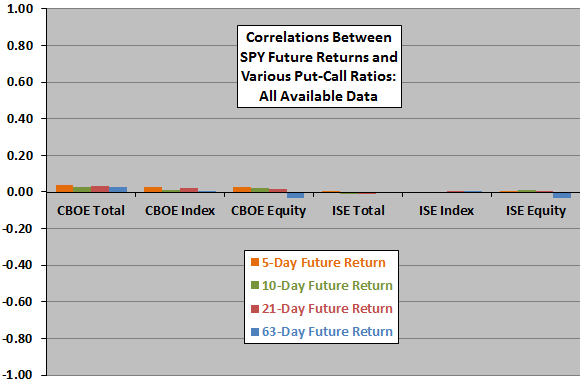 This result is not compelling, but in case there is an exploitable non-linearity in the relationship, we examine average 21-day SPY future returns for ranked tenths (deciles) of the CBOE Equity relative put-call ratio. 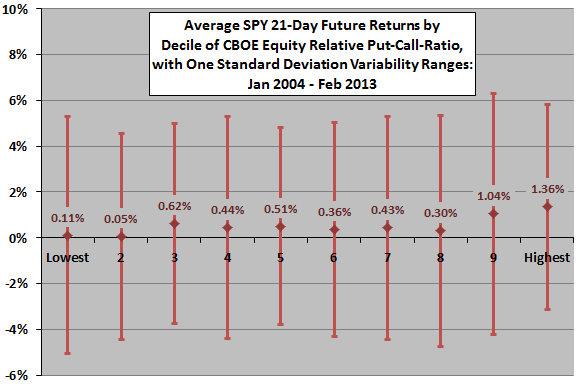 The final chart summarizes average 21-day SPY future returns by decile of the CBOE Equity relative put-call ratio since the beginning of 2004, with one standard deviation variability ranges. Results suggest potentially exploitable strong (weak) returns in the top (bottom) two deciles. There is perhaps a weak contrary pattern in deciles 3 through 8. As a final test, we construct a trading strategy to exploit extreme decile returns. The hypothetical trading strategy enters (exits) SPY when the daily CBOE Equity put-call ratio first crosses above (below) its 250-day simple moving average (SMA) since the last exit (entry). In other words, repeat entry and exit signals trigger no trades. 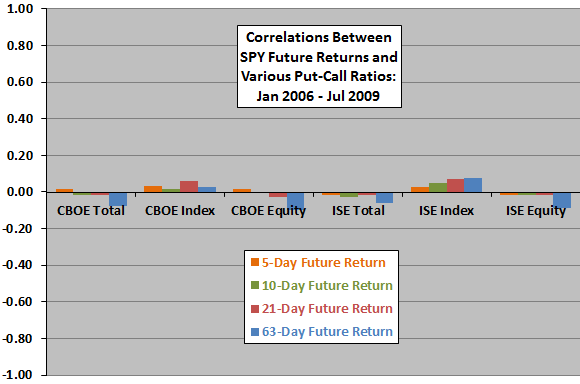 Daily put-call ratios are not known until after the close, so trades occur at the next-day close. The sample period is mid-January 2004 (to allow calculation of the first 250-day SMA) through mid-February 2013. Consistent with the interest rate environment during the sample period, cash earns no return. This strategy first enters SPY on February 8, 2005 and last exits February 4, 2013, generating 68 round-trip trades. With no trading friction, the cumulative return for the strategy over the sample period is about 19%. This gain turns to a loss for round-trip trading friction greater than 0.25%. For comparison, the buy-and-hold return for SPY from the first entry to the last exit is about 50%, so the trading strategy is unattractive. In summary, evidence from simple tests mostly does not support a belief that equity put-call ratios usefully predict future returns for the U.S. stock market. As noted, there are some inconsistencies in CBOE put-call ratio data. Return intervals for the above correlation calculations overlap, potentially distorting values. As noted, consideration of many indicators for the same set of stock market introduces data snooping bias, such that the best (worst) results overestimate (underestimate) reasonable out-of-sample expectations. Adding more ways to calculate relative put-call ratios would elevate the bias. The number of independent 63-trading day intervals for recent subperiods is small, and confidence in inferences for that horizon is therefore low. See “Purifying Stock Market Sentiment Indicators”, with findings that the CBOE Equity put-call ratio add little or no information beyond that in recent price action.